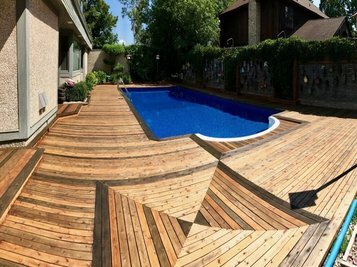 Viking Landscaping is an all-encompassing landscape company operating in Winnipeg, Manitoba, Calgary, Alberta, & Regina, Saskatchewan. The most important aspect of our business is the partnership we grow with our clients. We strive to build long-term relationships that enable us to anticipate and exceed your expectations. Viking landscaping Inc is a family owned and operated company. We have been operating as a landscaping company since 2005 and provide an all-encompassing design and landscaping construction service to our clients. We take in pride in knowing that our clients appreciate our expertise and dedication to landscaping. Our clients expect nothing but the best from us and we want nothing else except to meet those expectations. Our staff of skilled workers are ready to deliver on whatever our clients need. Winnipeg lies at the geographic centre of Canada and North America. Since it is one of the sunniest cities in Canada, Winnipeggers enjoy spending time in their yards. Winnipeg has very cold winters so that means not a lot of time spent outdoors but during the summer months, people want to spend as much time in their yards and enjoy the sunshine that graces this beautiful city. We want to provide all of our client’s yard in which they can enjoy spending time with family and friends. These are some of the services we provide our customers at Viking Landscaping Inc.
Irrigation systems are used to artificially provide your lawn with water. Our irrigation systems will help maintain your lawns rich green color and maintain anything that you are growing on your property. We split your yard into different zones and can install an automatic irrigation system that will water each zone at scheduled times or at the same time and place the sprinkler system evenly around each zone. Once it starts raining you won’t have to worry about shutting the system off as it comes with an automatic rain sensor. You will have one less thing to worry about knowing your lawn is being taken care of without you having to water it yourself. We have a wide selection of different paving stone styles for you to select. 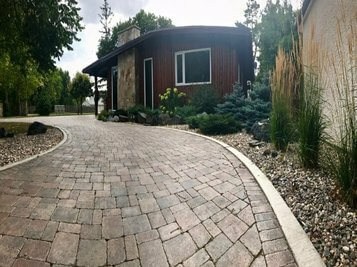 Paving stones are an easy addition to any yard, and laying patio pavers usually takes a couple days to complete depending on the size of the patio. Our landscaping team will lay out the design, setting elevations and excavating where necessary. We will then excavate the area to a minimum depth of 6” and then level and power compact it. Finally, we will lay down the pavers on screeted bedding material. Trees and shrubs form the framework of your landscape. Their beauty, shape, size, foliage, and flowers are important elements of a welcoming and inviting space in which to relax and enjoy. On mature trees, pruning is required to remove any brasnches that are dead or dying in order to maintain plant health and safety. This pruning type is referred to as cleaning. Lower branches will also require pruning. This process, known as raising, also can be used to increase the amount of light for turfgrass and ground covers beneath the crown of a tree. We also provide more landscaping services. 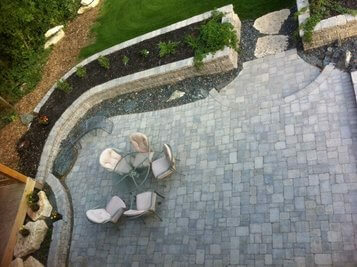 Viking Landscaping is an all-encompassing design and landscape construction operating in Winnipeg, Manitoba, Calgary, Alberta, & Regina, Saskatchewan. We strive to build long-term relationships that enable us to anticipate and exceed your expectations.